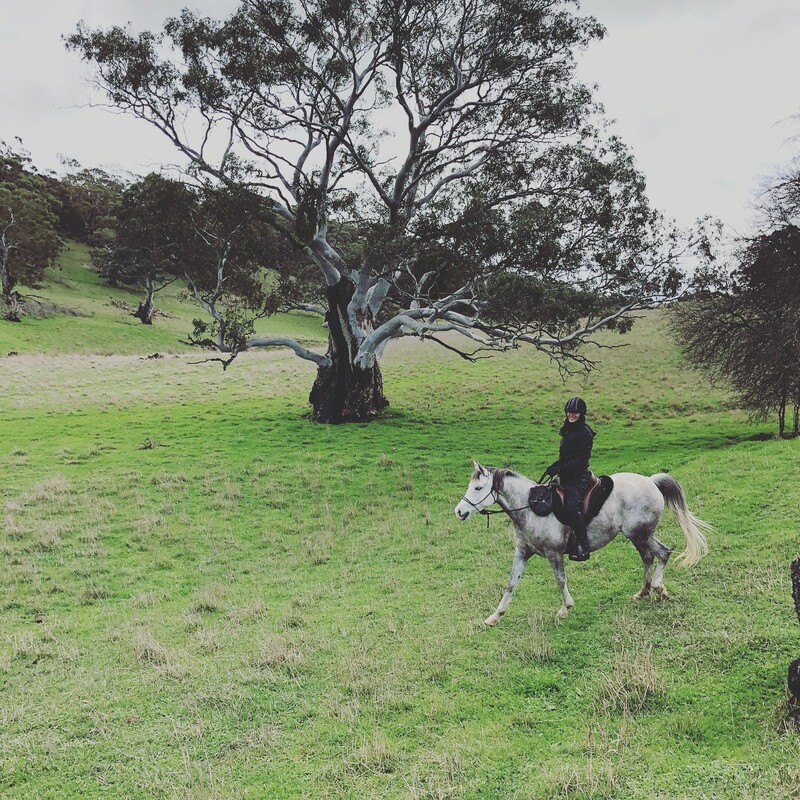 Clare Dingle recently rode on The Grape Horse Adventure in the beautiful Barossa Valley, South Australia. Known for its world class wines, the Barossa is a haven for foodies and wine lovers with spectacular riding trails to boot. Clare enjoyed herself so much she’s hoping to do it all again next year! Read on to hear her thoughts. All the meals were great – Jeremy’s cooking was delightful (along with the impromptu, but secret, cooking lesson! ), our pizza night was wonderful and our fine dining experience was excellent. Lovely warming lunches were gratefully consumed as was our breakfast at the local farmers’ market. Overall, brilliant! Moonshine (Moo) was so lovely. She was so nice to ride and I enjoyed her quiet meandering just as much as our fast canters (gallops). Moo could also have a side hustle as a ‘breathalyser’ – she seemed to know when I had enjoyed a warming drink at lunchtime and her lips would start twitching! It was all brilliant – despite the weather. 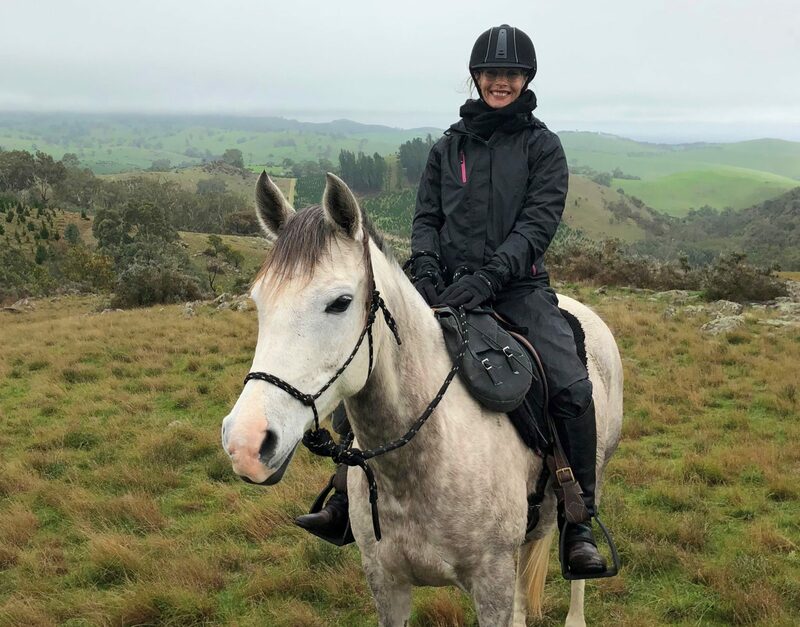 Certainly, at home, I would never have chosen to ride in cold and windy conditions, but I must say I really enjoyed riding in the wild wind on the hilltops on the first full day – it was great! This was my first Globetrotting holiday, but sixth ‘horse holiday’, and whilst it was the most expensive, I certainly got more ‘value’ when taking into account all the ‘extras’. I’ll be watching for next years’ dates – hopefully I will be able to go back and do it all again! The Barossa Grape Horse Adventure was magnificent! Jen and Jeremy were wonderful hosts, the horses were lovely, the food [and wine] was magnificent and I made some great new friends – overall, a perfect horsey indulgence. Feeling inspired to follow in Clare’s footsteps? Check out The Grape Horse Adventure here!